The Bureau of Substance Abuse Services (BSAS) oversees the statewide licensing of substance abuse disorder treatment programs and counselors. BSAS holds quarterly meeting in central Massachusetts for adolescent substance abuse providers throughout the state. During this past quarter’s meeting, Peter Ducharme, Director of Program Services, presented on our Transitional Living Program and housing services here at Bridge. Clients from recovery programs may find our programs a good next step on their road to recovery. Recovery can encompass a wide range of traumas. Recovery is not limited to substance use disorders, but also can include the trauma of experiencing homelessness, mental and physical abuse, or mental health struggles. For Bridge, it is a chance to learn about treatment facilities beyond the Greater Boston area. 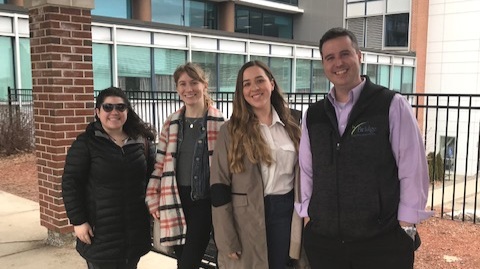 Peter Ducharme, Director of Program Services, and Bridge Counselors and Clinicians were invited for a site visit at Motivating Youth Recovery (MYR) in Worcester after Peter presented at BSAS. The meetings are an opportunity for agencies statewide to come together and network. Afterwards, we do site visits to fellow agencies to learn about resources available for youth at Bridge. This collaboration also helps establish a more formal referral process between programs.